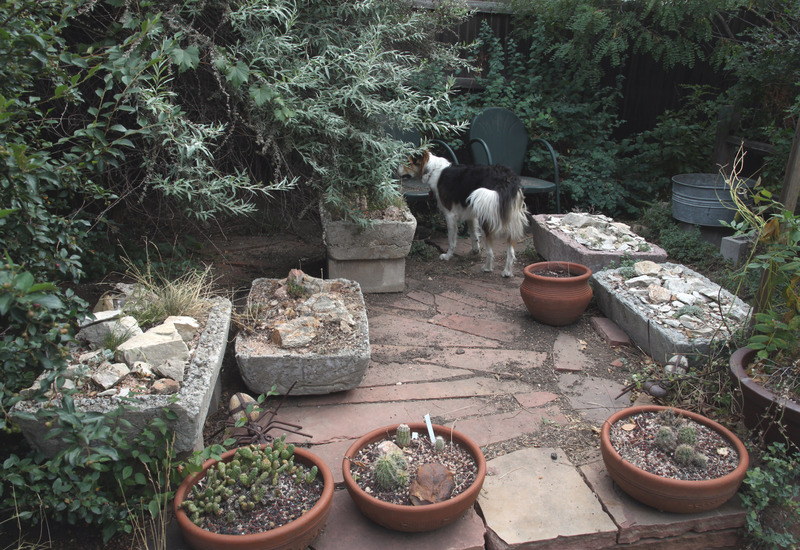 Greetings and salutations, everyone; yes, once again it is I, Mani the roastingly hot purebred border collie, filling in for the guy I live with, and here to bring you up to date on our roastingly hot, super sizzlingly dry garden. You may remember me from such other heat-related posts as “Beyond Super Roasting”, among at least a few others. Here I am in a characteristic pose. This was taken in the morning, before it got so unbelievably roastingly hot. It was just really, really hot, and the guy I live with has some sort of allergy that’s making his eyes “all burning, puffy, and blurry”, and so he was in a bad mood today, besides being hot. 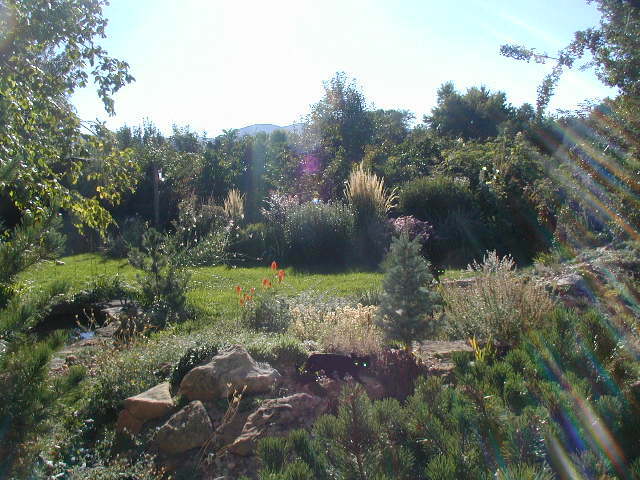 I have some pictures of the garden for you. It was so hot today that the camera almost melted. 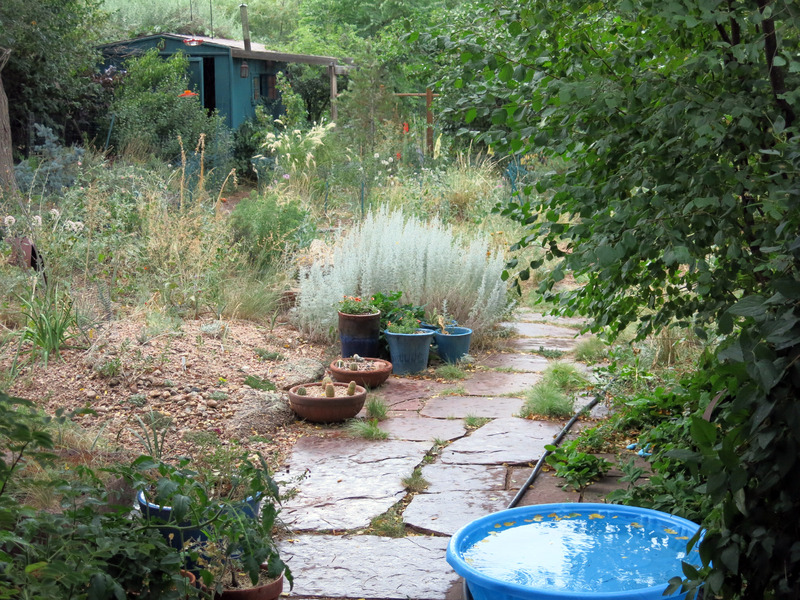 You can see a hose there, I think, but the garden doesn’t get very much hose water. It certainly hasn’t gotten much of any rain water, for months now. Except for that one time, when there was a little, but then the very next day the garden dried up again. This is me on what the guy I live with says is a lawn. If you memorize this picture, I’ll show you later what it looked like a long time ago, back when the guy I live with spent a fortune on water. 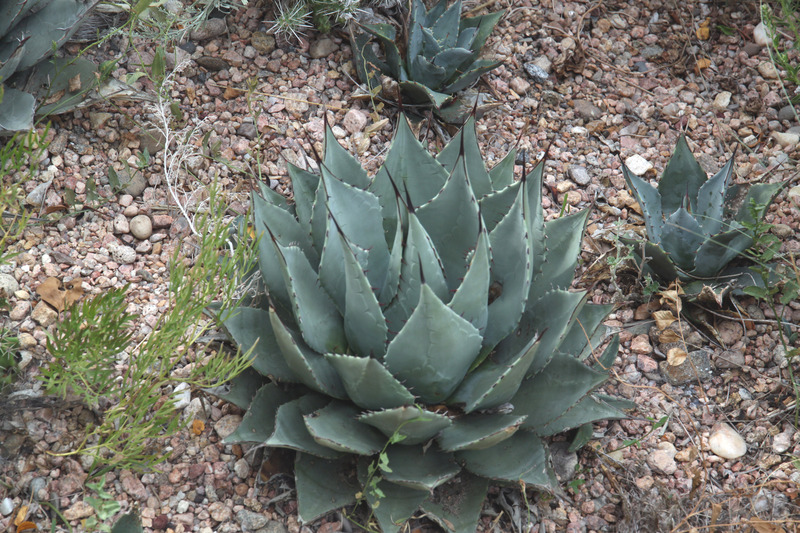 The agaves look pretty good. Maybe now you don’t wonder why this part of the garden is fenced off. The trough patio finally got cleaned up on a day when it wasn’t a zillion degrees out. The seed pots were emptied, after sitting there for a couple of years, and some of the troughs were moved. They weigh a couple hundred pounds each. The dirt still needs to be swept up. I’m posting these to make me feel cooler. They are also a bit sad. But I’m being selfish since it was so horribly hot today. This is Flurry, when he was really ancient, lying on the green lawn. There really was a green lawn here. They called it “The Great Lawn”, after English gardening books. This was about fourteen years ago. It doesn’t look very roasting hot to me. And that tiny puppy on the left is Chess. 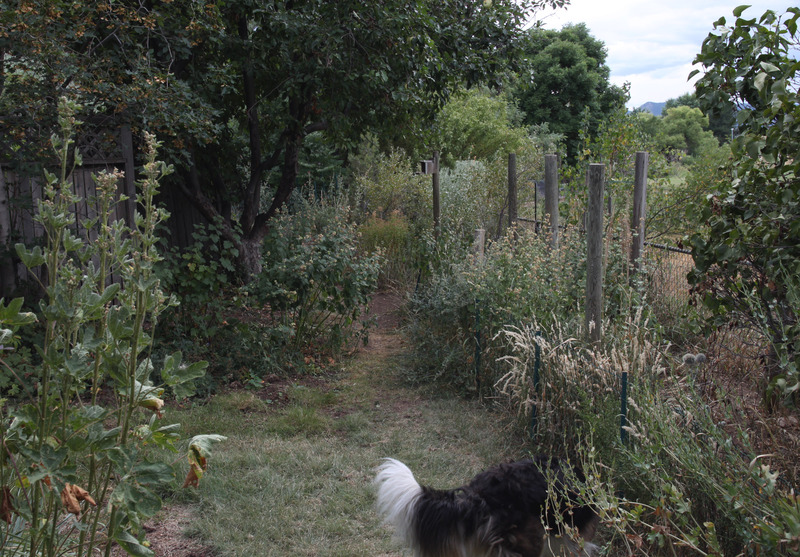 This was the “Long Border”. The guy I live with took this out the year after the lady of the house died. 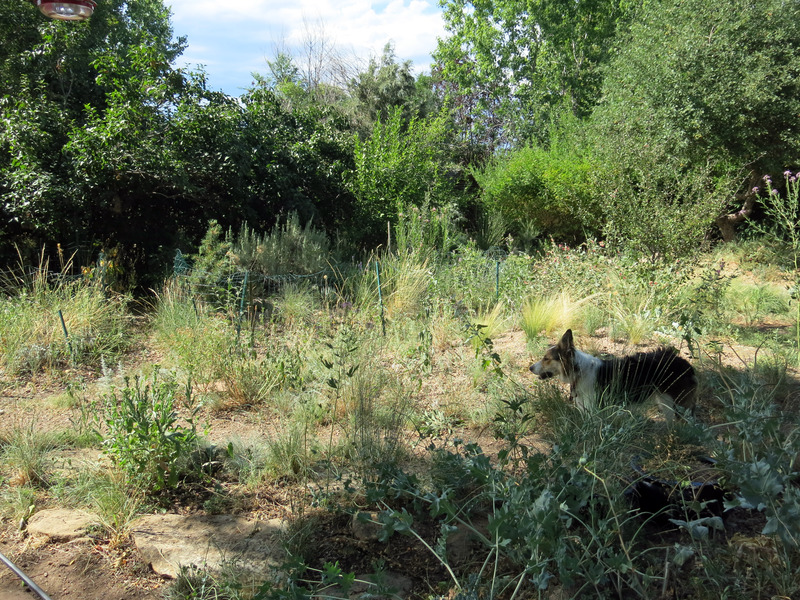 He always wanted a dry garden there instead, but she liked this so much, he kept it, even though it needed huge amounts of water. 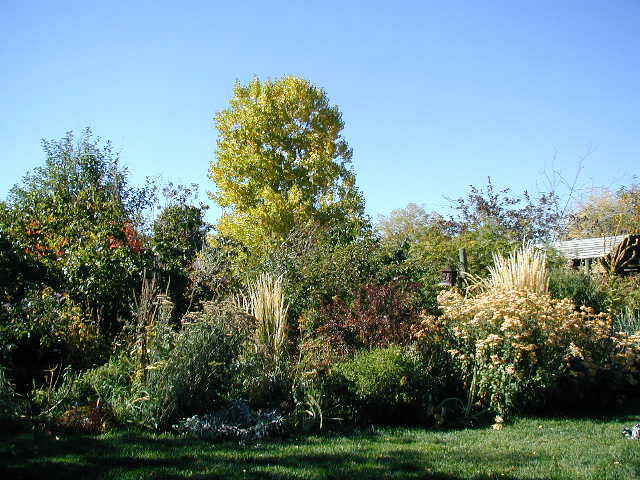 No one ever paid any attention to it when they came over to see the garden, and when he took it out, everyone said how much they liked it. 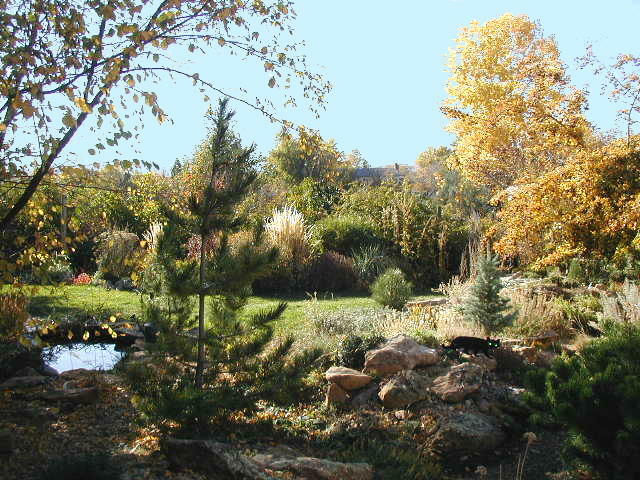 How it looked in autumn. Flurry again. The pool was filled up. It was a lot of work to maintain. 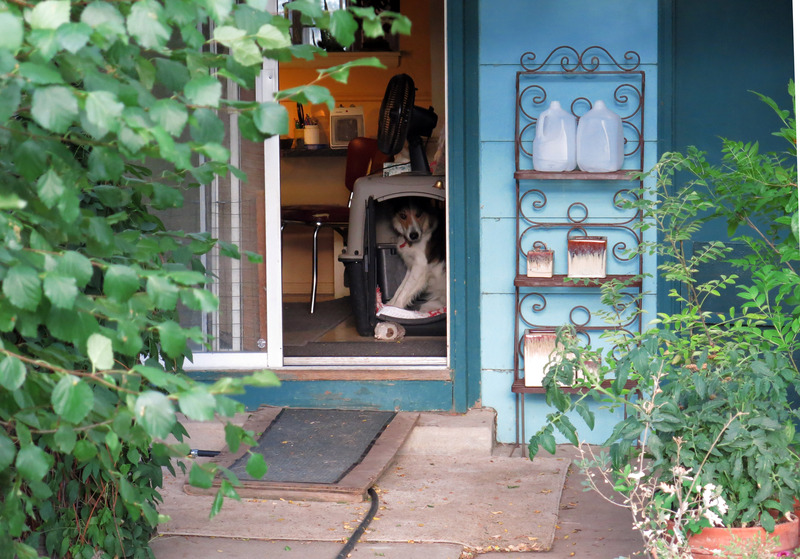 I heard this story, though, that when Chess, the border collie who lived here before me, showed up, on his very first day, he fell into the pool. And liked that a lot. Kind of a pleasant autumnal picture, don’t you think? 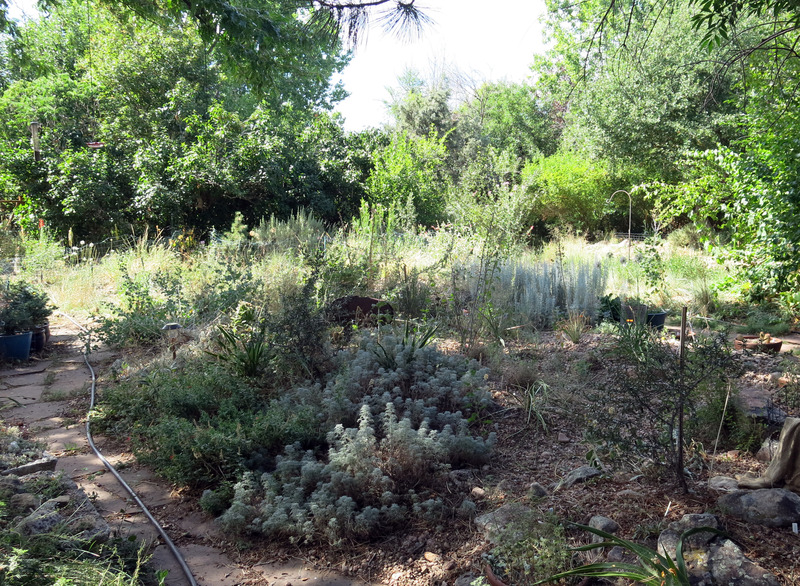 The guy I live with doesn’t feel like saying whether he likes the garden and “lawn” that replaced this better, or not, but the way it is now requires a lot less watering, and that’s good. Okay, one more cooling-off picture. A spring snow, on The Great Lawn. This is Slipper, on the left, about to attack Flurry, who was really too old to be attacked. But it happened anyway. I thought a nice cool interlude would be good. I know I enjoyed it, even though I wasn’t in any of the pictures. Back to today, now. I had planned to talk about how endlessly hot the weather is, and that’s pretty much how things go these days, though this evening it got really dark, and thundered, and started to rain. The rain didn’t last very long, but it cooled things off quite a bit. You might also see that the small tree that used to be in the middle of pictures like this isn’t there any more. There’s a reason for that. It was removed. I’ll talk about that some other time. It thundered quite a bit, and I know enough not to be outside when that happens. I’ll leave you with a picture of me not being outside when it’s thundering. Wow this is such a fascinating post and where are all the comments? I guess everyone is out watering. I know I am a slave to it and I don’t even have lawn. And Mani, that first picture with the tiny bit of tongue is irresistible. What were you thinking about? A playmate on green lawns maybe? 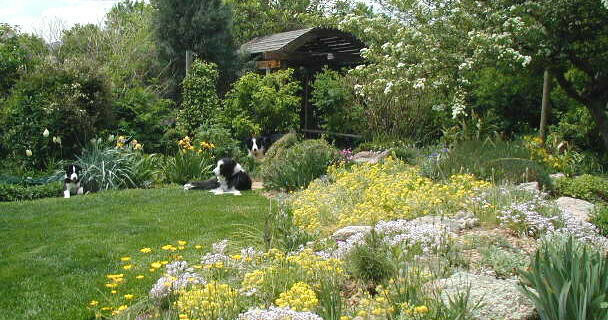 That lawn certainly looked more attractive because of the three border collies on it and I do have to say the garden was very pretty back then. But now, that trough patio has such a secret feel to it. 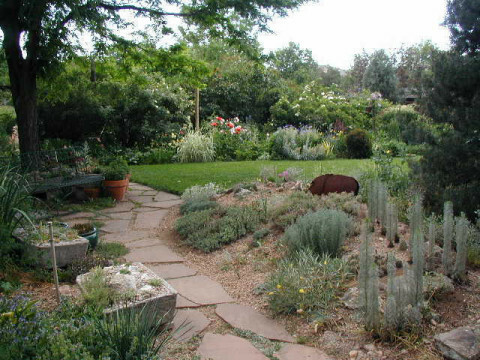 And a garden with pathways instead of lawn (which is what we have) is so interesting with all the different places to visit and you can’t see them all at once. Especially when the path is made by a dog. Those paths go to all the most exciting places, right? Thanks; well, the paths all go to where they go, which is the “way back”. 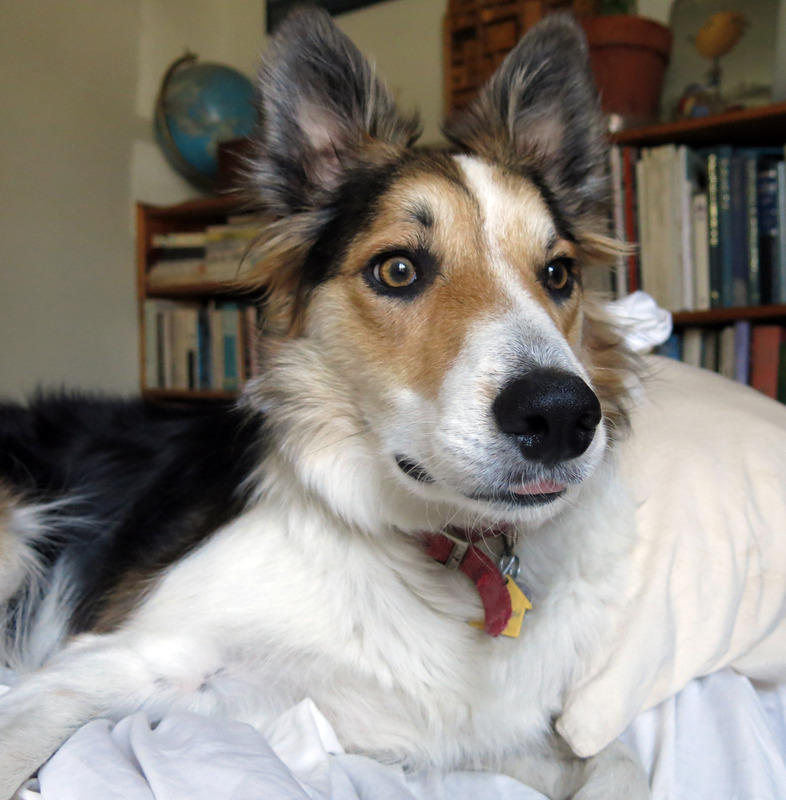 They were made by border collies. The green lawn really didn’t look as good as pictures made it look, and Chess would tinkle in one spot in the middle, and eventually there was this big dead spot in the middle, which is now the sort of mound where I used to like to survey stuff. (I don’t do that very much any more, because I discovered that the patio is a better place.) And then about six winters ago, voles ate the north third of the Long Border, and there was nothing left there, and so the guy I live with decided to make these mounds instead of replanting everything. (The voles left after wrecking everything.) I’m not sure what I was thinking about in the first picture; maybe how to get out of having my picture taken…..
A beautiful English garden, love the Great Lawn and The Border and The Pond. But, really, you and the guy you live with live in a hot DRY very much Not-England spot. Still, I do love me an English Garden and I know you would too, but what you do have is a splendid example of a Dry Garden. 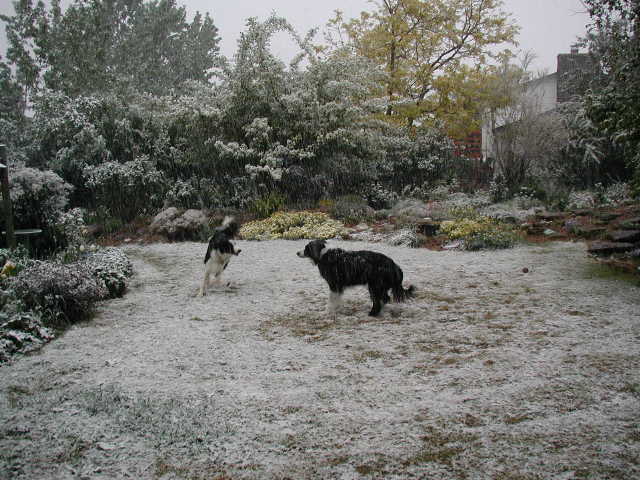 Many adventures turn up in a high, dry garden, and you do get snow, too, which happens maybe not so much in England. The trough garden looks all secret and excellent, and I’m impressed by the sun-ray design. Tell the guy you live with to hurry up and figure out what he’s allergic to so he can put his focus back where it belongs. Thanks; yes, the guy I live with has read Graham Stuart Thomas’ Three Gardens about twenty times. 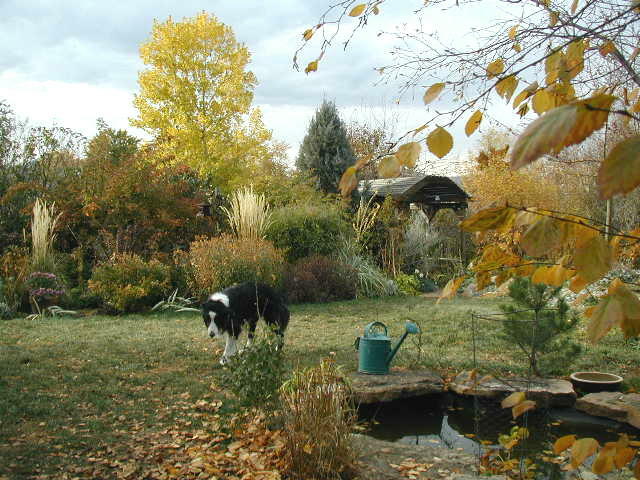 Maintaining this green lawn and garden was a huge amount of effort, and used a huge amount of water. (Water here is very cheap, but sometimes there had to be daily watering.) There were a lot of clematis, roses; a huge ‘Lawrence Johnston’, ‘Nevada’, and ‘Nymphenburg’, but “L.J.” got black spot, which we never used to have, and the soil was terrible, even with “frequent manurings”. And the stupid smooth brome invaded the Long Border and it was impossible to get rid of. (When the Long Border was removed, almost all the smooth brome roots were removed too, by digging.) The guy I live with says his eye thing is probably from the massive amount of perfume drifting through the air, from certain neighbors who apparently bathe in it. And scented laundry detergent. (There’s a post by David Lebovitz about this, too.) He was never allergic to anything until a few years ago. There’s this mysterious dermatitis which even a dermatologist couldn’t identify, too. And fabric softener sheets, which are poison. It wafts out from their dryer vents. Yep. We use Seventh Generation here.